As the new year begins, another year ends . . . and with the end of 2018 came another ending: the final issue of Pyramid. 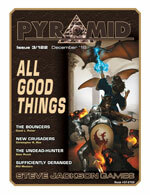 Pyramid #3/122: All Good Things celebrates the weird and wonderful ideas that the magazine has brought to GURPS, with new options for GURPS Dungeon Fantasy, the Dungeon Fantasy Roleplaying Game, GURPS Monster Hunters, and GURPS Infinite Worlds. This installment includes new threats for spacefaring heroes, new possibilities for weird-science practitioners, and more. Since it began in 1993, Pyramid has tried to deliver "all good things" in the gaming world, first as a bimonthly print publication (1993-1998), then as a weekly HTML-based site (1998-2008), and finally as a PDF-based magazine that delivered a new theme each month. But just as the mighty pyramids in Egypt eventually saw their completion, so too has this humble tribute to gaming goodness. A quarter-century is a good run for any endeavor, and it's one I've been proud to have been part of for the past 18 years. Thanks to everyone who's helped make Pyramid possible.